Students who attend cosmetology school need a great deal of high-quality training in order to prepare for a job in the field and pass the licensing examination administered by their state. In order to ensure success, students must find a school that provides rigorous hands-on and classroom training. In this guide, prospective beauty school students will find a description of the degrees available from these institutions, what criteria they should consider when looking at schools, and what they can expect after graduation. Studying for a degree in beauty or cosmetology is a great option for those with a passion to help others look and feel their best. Since this is an increasingly popular area of study, many schools now offer programs in beauty cosmetology to meet the heightened demands of prospective students. 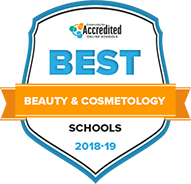 In order to streamline the search for the best beauty cosmetology schools and programs, we have ranked the top schools in this field based on their cost of tuition, financial aid opportunities, program count, student-to-teacher ratio and graduation rate. Explore the best beauty cosmetology schools and programs below. The Pamlico Community College cosmetology program is taught in a simulated salon so students can get hands-on experience with the fundamentals and artistic side of the craft. Students will learn the principles and procedures of working with hair, nails, skin and associated chemicals and imaging, as well as the business end, including computers and product knowledge. The certificate option requires 34 credit hours and 76 class hours to complete, while the diploma program requires 48 credit hours and 104 class hours. Upon completion, graduates will be qualified to sit for the State Board of Cosmetic Arts exam. If they pass, they'll be issued a license and qualified to work. The 15-month cosmetology program at Lake Area Technical Institute starts once in January and again in August. The course involves 2,100 hours of study and learning about hair, nail and skin care, including cutting, shaping, coloring and designing, as well as pedicures, manicures and facials. Learning takes place at the Cosmetology Lab, which is a fully operational salon located on the school's campus. All students must complete the South Dakota Cosmetology Commission board examination to become certified. In order to complete the cosmetology program at Arkansas Tech University, students must complete 1,500 clock hours, as mandated by the state governing agency. The program, which prepares students for the state licensure examination, covers the fundamentals of manicuring, facials, hair care and chemical relaxing, as well as state rules and regulations, salon management, sanitation and ethics. Applicants must provide a Social Security number, high school transcript or GED, driver's license and a $20 money order for a temporary certificate. Utah State University's cosmetology program culminates in an associate of applied science degree and holds the distinction of being the only one of its kind in the state where all learning is delivered face-to-face with instructors. Upon completion, graduates will be prepared to take the state board exam which is required to obtain the necessary license for employment. Not only do students leave with employment-ready knowledge about hair, nails, barbering and skin care, they'll also build a portfolio to present at their job interviews. Those who commit to an extra 300 hours can complete a supplementary nail technician program. Distance learners can pursue an online Bachelor of Applied Science degree in either cosmetology or cosmetology management at Siena Heights University as part of the college's online transfer program. Applicants must have previously earned an associate of applied science degree to qualify for either program. Incoming students can transfer up to 90 credits, and work history, training and other education are also taken into consideration. These programs are specifically designed for students who earned an AAS earlier in life and/or didn't plan to complete a 4-year degree, but changed their minds after working in the field. Upon completing the cosmetology certificate program at Northern Michigan University, students will be prepared for entry-level positions in salons and shops, to open their own shops or to pursue work with manufacturers of industry products. Students must earn 64 credits spread across a dozen courses, which include varying degrees of both cosmetology and physical services training. Attendance is mandatory for the program, which requires students to complete 1,500 clock hours. The university also offers a cosmetology instructor program. Students who complete the cosmetology program at Cossatot Community College will have all the prerequisites needed to qualify for the Arkansas State Board of Cosmetology exam, which students must pass in order to get a license. Only full-time students may apply to the program, and applicants must have a high school diploma or GED to be considered. Students who complete this 40-credit certificate program also have the option of transferring to Arkansas Tech University to complete a Bachelor of Professional Science degree. The certificate program is broken down into several sections, which students can pursue individually if they have transfer credits. The 30-credit cosmetology program at Wisconsin Indianhead Technical College takes 1 year to complete and results in a technical diploma. The 2-semester program qualifies graduates to sit for the Wisconsin Cosmetology Practitioner License exam. Financial aid is available to students, who can also choose to transfer their credits to a 4-year Wisconsin school in pursuit of a full bachelor's degree. The school offers a simple, 3-step admission process that can be wrapped up in a single campus visit. In order to graduate from the cosmetology program at Pickens Technical College, students must complete 1,800 clock hours and/or 60 credit hours with a C average. From there, graduates will earn a certificate which qualifies them to sit for the State Licensing Exam, provided they've completed all clusters before the exam. Courses, which last 4-7 hours and are held every day, are taught concurrently, not individually, although night classes are available. The program combines both theory and lab-style clinical training for hair, nails and skin that involves both people and mannequins. Graduates of the cosmetology program at Eastern Arizona College will be qualified to sit for the required licensing exam. Once they pass, they can enter the field and begin work immediately or move on to an associate degree for further education. The course, which takes place in a simulated salon, is intense. Classes are held for 8 hours a day, 5 days a week for 10.5 months. At the end, students will have completed the 1,600 hours that are required to qualify for the exam. There's also an instructor certification, a nail technician certification and refresher courses for professionals already working in the field. Cosmetology programs can be found at vocational schools, cosmetology schools, and community colleges. People who are interested in fashion or enjoy makeovers often pursue these degrees so they can follow their passion and learn what they need to know to have a fruitful career. Through extensive practical training and classwork, students obtain these valuable skills. Cosmetology vocational schools provide intensive, hands-on training for students who want to pursue careers as hairstylists, nail technicians, estheticians and other related beauty fields. These programs allow students to be taught by current practitioners in the field, while also allowing them to get the practice they need to be successful when they land a job after graduation. Vocational schools should also prepare students for their licensing examination, which is a must to obtain employment. Community colleges have degree programs in beauty fields that combine practical experience with theoretical study. Students learn the philosophy behind doing hair or nails, while getting the opportunity to put those theories to the test through experiential learning. In addition, students in these programs may be required to take some general education classes, such as psychology, mathematics and business. Beauty schools can be a great option for students because this is all the schools do and all they teach, while other schools have a much broader curriculum. These schools generally give students access to long-time industry professionals who can share the knowledge and techniques they gained through their experience along the way. In addition, beauty schools are equipped with the latest technologies, preparing students for the fast-changing industry by keeping them abreast of the trends. People won't let just anyone do their hair or nails, so prospective cosmetology school students shouldn't let just anyone teach them the tricks of the trade. The beauty business can get ugly very fast when a practitioner does not know what they're doing, so anyone who wants to learn cosmetology should be choosy about what school they attend. The following are some criteria that they should look for when considering beauty schools. In order to find employment in the beauty business, students will need to pass their state’s licensing examination. It's imperative they find a school that will prepare them for this test, otherwise they won't be able to obtain their license. The last thing a student needs from a beauty school is a group of instructors who either have not been in the business long enough to have the valuable experience that students need, or have not practiced in so long that they're unaware of the latest industry trends and technologies. Prospective students should be sure to ask about a school’s instructors to find out their credentials. Also, it's best to look for teachers who are not only still active the industry, but are leaders in the industry who have won awards or national cosmetology competitions. Cosmetology is a wide and varied field, so students should pick a school that has a lot of coursework in the area they want to practice in. If a student is interested in becoming a hair colorist, they need to pick a school that has a strong hair coloring curriculum. Similarly, a student who is interested in nail technology will not be happy in a program that primarily focuses on hair. Students need to think about their career goals and find a school that will help them best achieve them. The most important element of any cosmetology school is the first-hand experience students get as they earn their degrees. But, some experiences are better than others. Although some schools allow students to work on plastic dummies in order to learn hair techniques, students get much more value from a school that gives them the opportunity to work in an actual salon environment cutting clients’ hair. Students should find out if the school they're interested in will give them access to a salon environment before they enroll. To ensure that programs are adhering to high standards, students should look for schools that are accredited by the National Accrediting Commission of Career Arts and Sciences, or NACCAS. Over 1,000 schools around the country are accredited by the NACCAS, which ensures that they are following a quality curriculum that will best prepare students to work in the field. There are several kinds of degree programs that cover a broad spectrum of areas in the field. The curriculum of these programs differs depending on what kind of degree students wish to complete. While certificate programs have an intense focus on cosmetology subjects alone, students who obtain associate’s degrees generally also take courses not related to cosmetology. Students enrolled in any certificate or diploma program at a cosmetology school should expect to get class training and hands-on experience that will allow them to pass their licensing examination. Students who earn diplomas and certificates undergo intensive training that they can use to find an entry level position at a salon. This course familiarizes students with the basic concepts of cosmetology. This is where students first learn about topics like anatomy, first aid, hygiene, chemistry and the different products used in a salon. This course builds upon the knowledge that students previously learned and gives them more in-depth information. In addition, students in this course learn new concepts and topics such as chemical restructuring, hair coloring and manicuring. Students in this class get an introduction to salon services. Topics include shampooing, hair coloring, rinsing, relaxing and wigs. A cosmetology associate degree is designed to provide students with intensive training in cosmetology topics, as well as hands-on instruction. However, associate degree programs will also require non-cosmetology related subjects, giving students a more well-rounded educational experience. Those who complete these degrees also get the preparation they need to pass their state licensing examination. Although students are trained to enter entry-level careers with this degree, they can also develop business skills that will help them advance in their careers later on. Students learn the basics of hair design in this course, which covers topics such as infection control, properties of the hair and scalp, basic chemistry, anatomy and physiology. This class gives students a theoretical basis that will help them when they're actually working on their hands-on training. Class topics include hair texture services, hair styling, skin care, manicuring, hair cutting and hair coloring. This class familiarizes students with different thermal hair styling techniques. Students gain knowledge of the different types of thermal hairstyling tools and how to use them effectively. Although many hair stylists view themselves as artists, they are still working in a business environment and need to know the etiquette of business. Course topics include how to communicate with clients as well as other stylists, proper business attire and business networking. The beauty business is not just about hair. There are many different related programs that are offered at cosmetology schools that students can take to learn their craft and prepare for a rewarding career. The following are examples of related programs available at these institutions. Students in esthetics programs learn about every aspect of the industry through classroom instruction and practical training. These programs differ from school to school, and licensing requirements differ from state to state, but generally students can expect to take around 500 hours of instruction. In addition to learning about esthetics techniques, students learn about anatomy and physiology, health and safety techniques, and the laws that govern the field. Students in this class learn techniques for manual, electrical, and chemical facials. The course covers topics such as masks, chemical skin peels and scrubs. Students in this course learn techniques on how to shape and wax eyebrows, including tweezing and waxing. Whether they are applying makeup in the fashion world for models, or in a salon for everyday people who have just gotten their hair done, these professionals are an important part of the beauty industry. Makeup artistry programs at cosmetology schools train students on aesthetic principles and practical skills so they can go on to find a job. In addition to learning makeup application, they also learn how diet affects the healthy look of skin and the business skills they need to succeed in the workplace. This course prepares students to apply makeup in the fashion industry or at a salon. Students learn about different skin types and tones, makeup selection, application techniques and the role health plays on the look of someone's skin. Students learn about makeup application techniques for theatrical performances. In addition, they will study how to use makeup to create a character, or give someone the appearance of having a mustache or beard. This class is for students who are interested in becoming business owners. Course topics include creating a business plan, networking in order to attract clients, building a company website and creating a portfolio. Nail technician programs help students learn technical skills as a hone their artistic abilities. These programs, which require about 300 hours of instruction, prepare students for their state licensing examinations, as well as giving them tools they need to run a business. The following are some examples of the courses that can be found at a cosmetology school with a nail technician program. The students in this course get a foundation on the methods of pedicuring, manicuring and applying artificial nails. This course teaches students how to give a complete pedicure service, from nail analysis to foot massage. Cleanliness is an important part of being a nail technician, so students who take this course will learn how to protect their customers when performing services. Electrolysis program requirements largely depend on where a student attends beauty school. The amount of hours needed to obtain a license can vary considerably, but generally range from 300 to 1,100. In some states, practitioners don't need a license at all. No matter what state they're in, students in these programs learn the day-to-day tasks of electrolysis practitioners and gain valuable clinical experience. This course teaches students how to remove beards, unibrows, ear hair, and hair on a man's neck. In addition, students will learn how to shape eyebrows. This course gives students a glimpse of how hair removal is performed. Course topics include the history of hair removal, the laws and regulations practitioners need to know, and the different methods for temporary and permanent removal of unwanted hair. Just like other hair programs, barbering degrees at cosmetology schools are designed to prepare students to pass the licensing examination in their state through extensive practical experience and classroom instruction. Some of the courses can be applied to working with men and women, while other parts of the program are specific to cutting men's hair. This course familiarizes students with barber, styling and hair treatments. Specific topics include skin, scalp and hair disorders and how to treat them, how to sanitize equipment and safety measures that barbers must adhere to. Students learn the best practices for shaving a man’s face, as well as the materials and products that are used when providing this service. Some course topics include anatomy and physiology. Just as cosmetologists need to obtain a license to practice, cosmetology instructors are also required to meet their state’s licensing examinations. These programs teach experienced practitioners how to instruct those who want to follow in their professional footsteps. Students in these courses study teaching methodologies and theories that allow them to effectively teach students. Students in this course learn about theories of education. The skills gained in this course include how to develop lesson plans, supervise students as they perform cosmetology tasks, manage a laboratory and assess student progress. This course builds on the techniques students learned in the introductory course, giving them more information about lesson planning, doing demonstrations in class and performing administrative duties. By the time students are close to finishing their cosmetology studies, they should be well-prepared to practice in the field and pass the licensing examination in their state. There are some characteristics students possess that set them up for success when they're earning a cosmetology degree. The following are some examples of what students need to have in order to graduate and be successful in the field. Cosmetology students have to be able to communicate effectively with their clients in order to be successful. They must have good listening skills, so when they’re doing a beauty consultation, they understand what their client wants. In addition, they must have good verbal communication skills, so they can give advice to clients in an authoritative manner. Communication skills are also important when dealing with colleagues in a salon in order to foster a team environment. These go hand-in-hand with communication skills when it comes to making salon clients happy. Students need to be able to ensure that every customer that leaves their chair feels like they got exactly what they wanted. And if they don't, it's a stylist’s job to be able to think on their feet and do what's necessary to fix any problems with their service. Also, a professional needs to keep their stations clean and create an atmosphere that makes clients feel welcome. To be successful in a cosmetology program and the cosmetology field, students must be able to demonstrate an understanding of industry standards. From knowledge of theoretical concepts to the ability to demonstrate a certain technique, students must show that they've learned the tricks of the trade. In addition, they need to demonstrate that they understand safety precautions, sanitation techniques and business standards. And after they've graduated, they must always stay abreast of new developments in the field in order to give the best service possible. Whether students choose to specialize in makeup artistry, salon styling, barbering or esthetics, choosing a specialization is as important as choosing the right school. In order to excel in a program, and in a career, students should choose a specialization that matches their interests and strengths. If students don't like what they're doing, they're not going to do it well and their clients will suffer for it. Stephen Sanna, a hair colorist at Pierre Michel Salon, discusses his experiences in cosmetology school. What made you decide to earn a cosmetology degree? I was always interested in hair and beauty but went to college and worked on Wall Street for a few years. I decided that a more creative career was for me. So I took the plunge and enrolled in the Robert Fiance Beauty School and have never regretted it. What I enjoyed most about the program was learning how to change the way a client looks. I enjoyed the techniques that were taught to alter someone’s appearance and learning that I had a talent for it. The most challenging part of the program was learning how to understand what the client wants. What they say is not always what they want. You learn how to shampoo, a basic haircut, a perm or color as part of the training you work in the school salon. But now you are working on real people, having a consultation and hoping that that what you learned is what the client wants. I think school gives you the basics how to shampoo and a haircut. You really need to be an apprentice. There is so much more that goes on in a salon that the school never touches on. After Cosmetology School: What’s Next? After graduation, barbers and hairdressers may enjoy a number of career options, including working in a salon, resort, or spa. And the U.S. Bureau of Labor Statistics reports that jobs are on the rise in these professions, and between 2012 and 2022, there will be a 13 percent increase in employment opportunities. These are fast-paced jobs, which often require that professionals work long hours including evenings and weekends. Day-to-day duties of these professionals includes activities such as sanitizing their workstations and tools; washing, coloring, and conditioning clients’ hair; recommending the right treatments after inspecting someone's hair and scalp; and receiving payments from customers. Provides services such as hair cutting, styling and coloring, scalp massage, hair extensions and more. Suggests different treatments and services to clients, keeps records of client past services and sets prices for services. Cleans, shapes and decorates client fingernails and toenails. Performs hand and feet massages. Suggests special treatments and services. Provides special skincare treatments to face and body. Cleanses, exfoliates and moisturizes skin, addresses and suggests treatment for skin problems such as dry skin or acne. Removes unwanted hair via approved treatments, encourages skincare follow up treatments. Jeff Chastain of the Jeff Chastain Parlor is a graduate of the Gene Juarez Academy of Beauty in Seattle. Below he gives advice to those who are thinking about enrolling in a cosmetology program. out a few schools that way. It's worth the time and money to see how the instructors interact with the students. Did you like your service? Do you feel the student was learning? Also, ask the student questions and talk to the instructor to get information.